When Edinburgh restaurant owner Alex Maclennan is found dead in his bathroom, Inspector Jenny Logan is called in to investigate. 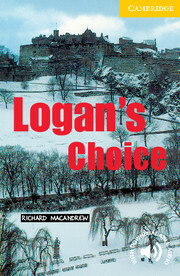 At first his death looks like an accident but Logan begins to think it could be murder. Does his wife, his brother-in-law or his friend know more about his death than they will admit? Logan uncovers the truth about Alex's business affairs and personal life, and devises a plan to catch the killer.